I CAN’T quite believe I’ve already had a week and a half off work – I’ve lasted 11 more days without going in to hospital than on my maternity leave with Santi! I haven’t stopped, but at the same time feel like I haven’t achieved much at all. I certainly haven’t been relaxing like I intended to when I finished work a week early! I’ve met friends for lunch, my mother and sister-in-law for coffee, built a bookcase, put up two lightshades – one of which I painted with lightning bolts for Santi’s room – had a haircut and ordered a load of summer clothes for Santi in case I didn’t make it to the shops. I’m not sure if this is what counts as nesting, but it’s been exhausting. Me and Stew went for a nice lunch one day last week just in case we don’t have a chance again for a while … followed by a trip around Toys R Us for Santi’s birthday presents (date days aren’t quite the same when you have children!). We also snuck in a Costa on Sunday morning, and another one after my consultant appointment on Tuesday … I swear I’m keeping that chain in business! Saturday was lovely because three of my friends came down for the day. The weather was terrible, which was a shame because we went for lunch at a golf club which usually has really pretty views, but it didn’t really matter. We so rarely get a chance to get together now that families are growing and things, so when we do we have so much to catch up on. I can’t believe that the next time I see them I’ll be a mother of two, and that it’ll most likely be to say goodbye to one of our group who is moving to Canada! 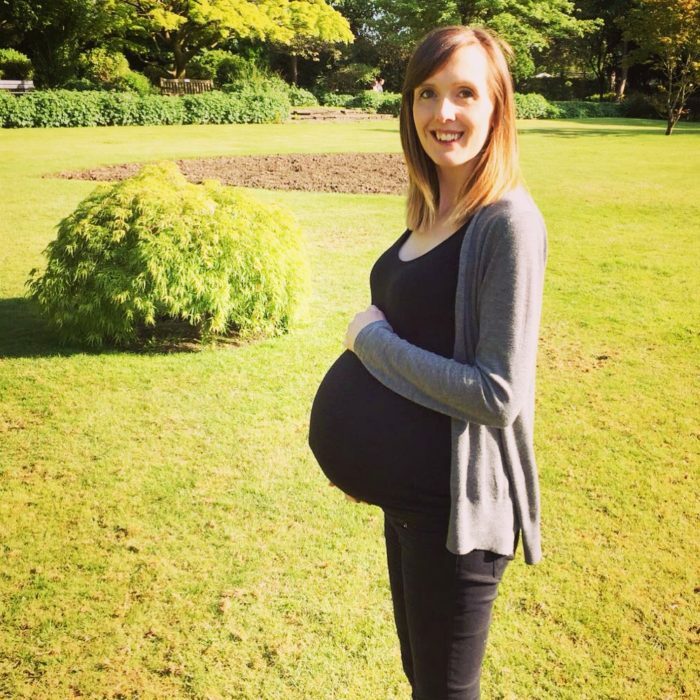 Every time I write one of these updates I say how big the bump is getting, and yet it is still growing! The girls said it wasn’t as big as I think, which was nice of them, but I get a lot of comments about the size and how it looks fake because I’m still so tiny. I weighed myself this morning and I’m back down to having put on less than a stone, so it’s no wonder I look out of proportion. I wandered around Topshop one day holding up clothes in my normal size, and it’ll be so nice to be able to buy some new outfits soon and get rid of my maternity jeans. I’m finding it more difficult to get around now, and definitely feel it if I overdo it during the day. Yesterday I was out of the house from 9.45am until 4.15pm and only popped home to put the washing on … then last night I could barely walk up the stairs because my legs hurt so much! I’ve taken it easier today, but still ended up walking into town twice to drop Santi off at nursery and meet a friend. I’ll regret keeping so busy when the baby is here and I just want to chill. I’ve been getting Braxton Hicks quite a lot and usually around the same time in the evening, which puts me on edge going to bed as I keep wondering if we’ll end up going in to hospital … 70 per cent of women go into labour at night so it’s a possibility! Could this be the last bump photo?! Yesterday we had one final growth scan and appointment with the consultant. It’s amazing to see how baby is growing at all the scans. You go from being able to see the whole body from head to toe in one shot, to just specific parts fitting onto the screen. As expected, he or she is bigger again, but looks on track to be around the same size as Santi so I’m not concerned. The consultant seemed happy too, and surprisingly has booked me in to be induced on my due date. We were both expecting me to be whisked in quickly like with Santi, but because there were no complications last time they’re happy to wait. That was a bit of a shock as they’ve said all along that I won’t be allowed to go to 40 weeks, but I guess they know best! Hopefully baby will make an appearance before then to save my little body from carrying the bump around any longer. He or she is head down and 2/5 engaged, so it’s a waiting game now. Baby is the size of… Some kind of melon. Or probably more like a beach ball. Oooohh this is exciting this week! We’ve bought a new stroller (such an American word but this is in between a buggy and a pram so the best word to desrcibe it). With Santi we bought a travel system with a car seat that fitted on to the pram base, and didn’t really need a new one except that I thought it was getting a bit scruffy. Seeing as we can use Santi’s old pram if we want to attach the car seat, we went for a pushchair based completely on the design we liked this time … introducing the Donna Wilson for Mamas and Papas Three Bears stroller! Isn’t she pretty?! 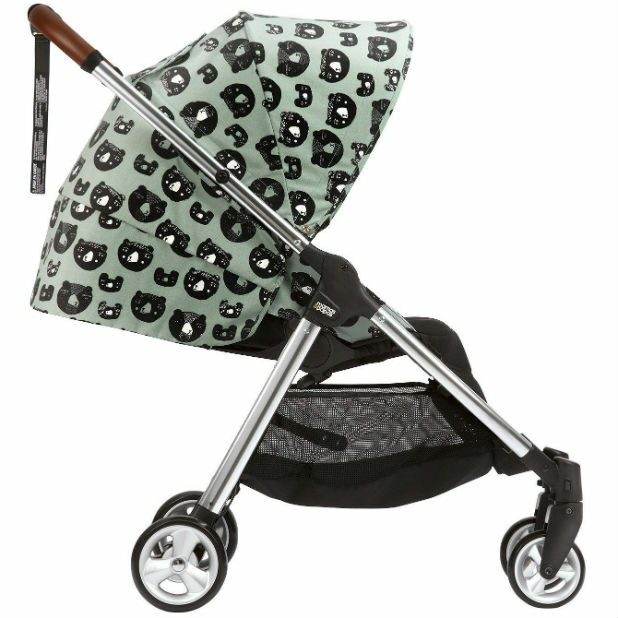 I was in love with Donna Wilson’s fox design when we were looking for a pram for Santi, but the whole system with the car seat etc cost nearly £700 and we just couldn’t justify it. As this is just the stroller (and my parents very kindly offered to pay) we could be swayed just by the design this time … and I can’t wait to be pushing it around! Santi will still fit in it, so I just need to buy a baby carrier in case I end up pushing him and having to carry the baby. I’m hoping to get one by Tula because they’re really pretty, but will wait to find out the gender before choosing a design. Having a baby! I really hope we’re not kept waiting until due day to meet this little one … but then again I don’t want to be in hospital on Santi’s birthday either. We might throw an early celebration for Santi over the weekend depending on who can make it, just in case his actual birthday is a bit chaotic. He’s too young to know it’s not on the right day and I won’t be plagued with guilt if we can’t celebrate. If there’s no baby by the weekend we’ll be going to a birthday party on Sunday as one of Santi’s little friends from our maternity leave is turning two, and we might go to a comedy club on Friday. Apart from that I am actually going to take it easy! ← Dubai Dreams: Our first holiday as a family of four? Oh I hope the next update will be a birth announcement! Let me know if you try out a Tula – my only concern is that it can’t be used from birth without an insert. The designs are so pretty though! I remember when I was 38 weeks with Blake and I was so exhausted. I love your choice of stroller not heard of the make before but love the cute best print. The Mamas and Papas stroller is gorgeous and your bump looks beautiful, your glowing! Sending you virtual hugs. I hope the baby doesn’t keep you waiting for too long.